Ghosts are projections in the simulation of reality, which is after all an illusion that your mind tells you is real. The most common place to see ghosts are in areas where the grids have spiked such as war zones, disasters, acts of violence, vortexes, and paranormal activity such as UFO sightings. When your mind suddenly jolts back to his reality upon awakening, and you see a ghosts, angel, or other disincarnate entity, it is actually focusing on two different grid realities at the same time. When you fully returned to your physical body, the projected image will disappear. Sometimes you come back into your body within knowing that you going to have a glimpse of something not in this reality that will bring greater purpose to something you were going through or give meaning to your destiny. For example, you suddenly wake to see Jesus standing at the side of your bed. From that moment on you will feel that there is something important that you're here to do. February 2019 - An odd piece of footage from Colombia appears to show an apparition lingering in the former mansion of infamous drug lord Pablo Escobar as it was demolished. The strange scene was reportedly captured last Friday in the city of Medellin when government officials razed the palatial estate using explosives. Shortly after the building was destroyed, a video of the event appeared online and a curious anomaly caught the attention of viewers. February 2019 - Ellie Boiling - West Sussex - spooky pub is plagued with ghosts. A punter is seen standing at the bar when a phantom figure appears behind him. It slowly moves towards him before vanishing. A ghost is an alleged non-corporeal manifestation of a dead person (or, rarely, an animal or a vehicle). It is often thought to be a manifestation of the spirit or soul of a person which has remained on Earth after death. According to some beliefs, a ghost may be the personality of a person after his or her death, and not directly tied to the soul or spirit. Every culture in the world carries stories about ghosts, though they often disagree as to what ghosts are and whether they are just figments of imagination or a part of reality. Multidimensional entities have always been part of our experience in third dimension. Ghosts sightings have been reported in most parts of the planet - with some reports being written, photos, drawings, folk tales, even carved on stone (hieroglyphs in caves). 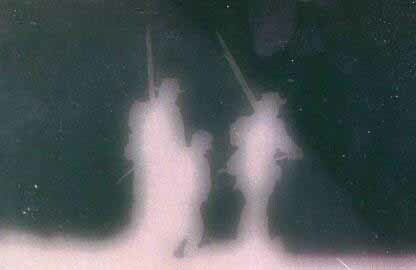 Ghosts are often depicted of a human size and shape (although some accounts also mention animal ghosts), but typically described as "silvery", "shadowy", "semitransparent", "misty", "human-like", "big", "scary" or "fog-like". Parapsychologists refer to the "substance" of which ghosts and other spirits are made of as "ectoplasm". Ghosts do not have a physical body like human beings, but only a subtle astral body. Sometimes they do not manifest themselves visually but in terms of other phenomena, such as the movements of an object, spontaneous throwing of a light switch, noises, etc., which supposedly have no natural explanation. Some ghost researchers approach the possibility of ghosts from a more scientific standpoint, seeking to find correlations and causal relationships between recordable phenomena and the supposed presence of ghosts. Those who follow this approach most often believe that ghosts are not actual disembodied souls or spirits, but rather they are impressions of psychic energy left behind by a deceased (or in some rare cases, still living) person. They assert that traumatic events (such as a murder or suicide) cause mental energy to be released into the world, where it may be experienced by other people who are sensitive to its presence. This way of thinking classifies ghosts in the same category of preternatural unexplained phenomena as poltergeists/telekinesis, ESP, and telepathy. 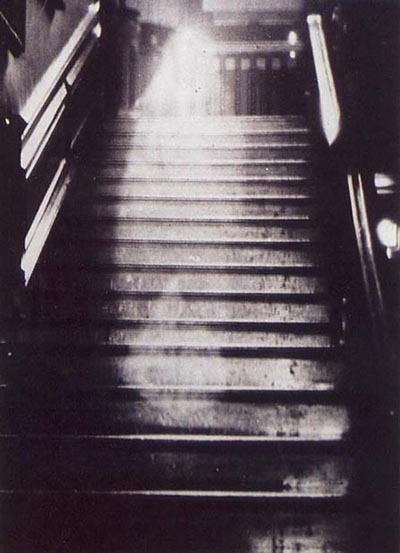 Theories from this approach often encounter difficulties in explaining ghosts that appear to be sentient, such as those which answer questions or react to specific actions from people present. However, it may be possible that enough of a dead person's psyche might be imprinted on an environment so as to give the likeness of thought or autonomy. Very detailed information about ghosts is given in Garuda Purana, a scripture from Vedic (Hindu) tradition. How ghosts fit into this worldview is shown here. Both the West and the East share some fundamental beliefs about ghosts. They may wander around places they frequented when alive or where they died. Such places are known as "haunted"; the rounds they go on are known as "hauntings". They often wear the sort of clothing in which they would have been seen when alive. Buddhist Samsara includes the concept of the hungry ghost realm. Sentient beings in that realm are referred to as "hungry ghosts" because of their attachment to this world. Asuras are also referred to as "fighting ghosts". While some accept ghosts as a reality, many others are skeptical of the existence of ghosts. For example, the vast majority of the scientific community believes that ghosts, as well as other supernatural and paranormal entities, do not exist. Skeptics often explain ghost sightings with the principle of Occam's razor, which argues that explanations should maximize parsimony with the rest of our knowledge. They may suggest that, since few to none of us have ever had an interpersonal relationship with a ghost, but most or all of us have had an experience of self-delusion or have attributed a false cause to an event, that these options should be preferred in the absence of a great abundance of evidence. They are also keen to note that most ghost sightings happen when our senses are impaired, and that the evidence is unreliable because it doesn't occur when we have full use of our faculties. Occasionally, the sincerity and motive of the claimant will be questioned. They might make up a haunting for a personal reason. For example, lingering of ghosts is typically associated with seeking justice or revenge. Ascribing such motives and powers to dead people could be interpreted as a scare tactic. Also, a person might claim a haunting for personal popularity and income. Human physiology may make us more susceptible to ghost sightings. Ghosts are often associated with a chilling sensation, but a natural animal response to fear is hair raising, which can be mistaken for chill. Also, the peripheral vision is very sensitive to motion, but does not contain much color or focused shapes. Any random motion outside the focused view can create a strong illusion of an eerie figure. Also, sound waves with frequencies lower than 20 hertz are called infrasound; they are formally inaudible, but British scientists Richard Lord and Richard Wiseman have concluded that infrasound can cause humans to feel a "presence" in the room, or unexplained feelings of anxiety or dread. Sometimes ghosts are associated with electromagnetic disturbances, which suggests that they might be attributable to the electromagnetic field and not to a presently dead person. Often, videos of paranormal investigators will show them using E-field or B-field detectors and finding "ghostly" results near wall outlets and electrical appliances. Psychological factors may also relate to ghost sightings. Many people exaggerate their interpretation of their own perceptions, either when visiting a place they believe to be haunted, or when visiting a site which they know has seen unpleasant historical events. Certain images such as paintings and movies might "program" a person to automatically associate a certain structure or area as haunted because of what they have seen in the movies. As well, the psychological phenomenon of pareidolia may cause people to perceive human-like faces or figures in the otherwise mundane surroundings of their environments, particularly in conditions where vision is partly obscured, as in a dark corridor or at night. Some of the most popular places haunted places are sacred burial grounds, cemeteries, sacred/power sites, places where there are strong magnetic fields, places of religious worship, caves, places where acts of violence occurred, taverns, theaters, ancient ruins, castles, and perhaps even in your home. Many people see ghosts of family members in their home. - A scent associated with the spirit. For example - if the spirit smoked cigars while in a physical body - you might smell a cigar scent in the room. - Noise - Spirit turns on an electric appliance - usually linked to them. - Rapping's include thumping, knocking, tapping or bumping. In ancient times rapping was thought of as an omen of approaching death. - Ghost phone calls from a deceased soul - usually a family member. It usually means that the deceased soul wants to impart a farewell message. Many such calls occur on days of importance such as Mothers Day, holidays or birthdays. People who have received phone calls from the dead report that the voices are often exactly the same as when the person was living. The telephone rings normally but the connection has static. The voice of the deceased tends to grow fainter as the call progresses. Sometimes the voice fades away completely. In some very interesting cases the call is placed long distance and connected by an operator. Checking with the telephone company usually turns up no evidence of a call on their records. Phone calls are sometimes placed to the dead as well. A person places a call to someone only to find out later that the person was already dead at the time of the call. Ghost haunt people and places for many reasons. Often they have messages they wish to convey before they move on to a higher realm - or back to the creational Source. The messages may concern the circumstances surrounding their deaths - such as murder, suicides, accidents, other foul play. Often the ghost has unfinished business - such as inheritances/wills - finding lost papers and other items belonging to the ghost. Many ghosts do realize that they are dead - as the death was instantaneous rather than from a prolonged illness. Many ghosts choose to live close to the family they were part of when they were in a physical body. Some ghosts like to remain in the physical frequency of the home in which they once lived. As in all things some ghosts are positive while some are negative energy. A manifested ghost can be seen by one or more people at the same time. But there are instances where only one person in a room can see the ghost while the other people see nothing. Spirits exist in higher frequency realms. When a spirit manifests as a ghost - it usually is able to produce something that is physical. Ghost stories date back to before even the Common Era. In the Biblical account of the Witch of Endor, King Saul of Israel has the witch conjure up the ghost of the prophet Samuel to consult with him on his precarious situation. The prophet's spirit gives the king no assistance, but rebukes him and foretells his doom instead. Belief in ghosts can be traced back as far as 2,000 B.C. This first record of a ghost comes from the Babylonian story The Epic of Gilgamesh, and is etched in clay tablets. The story tells of the hero Gilgamesh and the ghost of his dead friend, Enkidu. "And Nergal, accustomed to absurd orders, obeyed as soldiers do. to Hell through the bowels of earth. tried and failed to do anything but sob. "Speak to me please, dear brother," whispered Gilgamesh. "Tell me of death and where you are." "Not willingly do I speak of death," said Enkidu in slow reply. time, I will describe where I do stay." "Yes," his brother said in early grief. "All my skin and all my bones are dead now. "Yes," sobbed one enclosed by grief. "Since we must understand whether ghosts and spirits exist or not, how can we find out? Mo Tzu said: The way to find out whether anything exists or not is to depend on the testimony of the ears and eyes of the multitude. If some have heard it or some have seen it then we have to say it exists. If no one has heard it and no one has seen it then we have to say it does not exist. So, then, why not go to some village or some district and inquire? Hungry Ghost Festival- There is a traditional Chinese festival/holiday, which is celebrated by Chinese in many countries. In the Chinese calendar (a lunisolar calendar), the Ghost Festival is on the fourteenth night of the 7th lunar month. Activities at the festival include preparing ritualistic offering food, and burning hell money to please the visiting ghosts and spirits as well as deities and ancestors. Other activities include burying and releasing miniature paper boats and lanterns on water, which signifies "giving directions to the lost ghosts". A very solemn festival, the festival nevertheless represents a connection between the living and the dead, earth and heaven as well as body and soul. Perhaps one of the earliest known ghost sightings took place in Athens, Greece. Pliny the Younger (c. 63 - 113 CE) described it in a letter to Sura: Athenodoros Cananites (c. 74 BCE - 7 CE), a Stoic philosopher, decided to rent a large, Athenian house, to investigate widespread rumors that it was haunted. Athenodoros staked out at the house that night, and, sure enough, a dishevelled, aged spectre, bound at feet and hands with rattling chains, eventually appeared. The spirit then beckoned for Athenodoros to follow him. Athenodoros complied, but the ghost soon vanished. The philosopher marked the spot where the old man had disappeared, and, on the next day, advised the magistrates to dig there. The man's shackled bones were reportedly uncovered when this was done. After a proper burial, the hauntings ceased. The most famous and most often reported ghost in the Tower Green is Anne Boleyn. She was beheaded by her husband, Henry VIII, in 1536. She is now said to carry her head under her arm on the eve of her death. Anne has also been seen in the Tower Chapel. One night, a guard captain and a sentry set off on their rounds, but when they reached the chapel they both noticed lights coming from inside. The captain sent for a ladder and climbed up to a window to look within. He found the interior lit with a blue-white light, and a ghostly procession of men and women in Tudor costume could be plainly seen walking down the central aisle. At the head of the procession was the spirit of Anne Boleyn. Suddenly the light faded and the chapel was left in complete darkness. In 1816 a sentry was walking his beat in front of the Jewel House when he saw a dark shape moving on the steps of the building. He approached the figure just as the moon came out from behind some clouds, revealing a huge bear lunging at him. Panicked, he struck out at the bear with his bayonet but the blade simply passed through the bear, which then engulfed him. He was later found unconscious by another sentry and died shortly after. On the 12th February 1957 a guardsman came face to face with one of the ghostly residents at the foot of the Salt Tower. It was 3.00 am when something struck the roof of the sentry-box in which he was sheltering from the rain. Stepping out, he looked up to see what it was, and saw a shapeless white ghost on the top of the tower. He shouted, bringing out the guard captain and the duty warder. They both searched the Tower, but could find nothing. 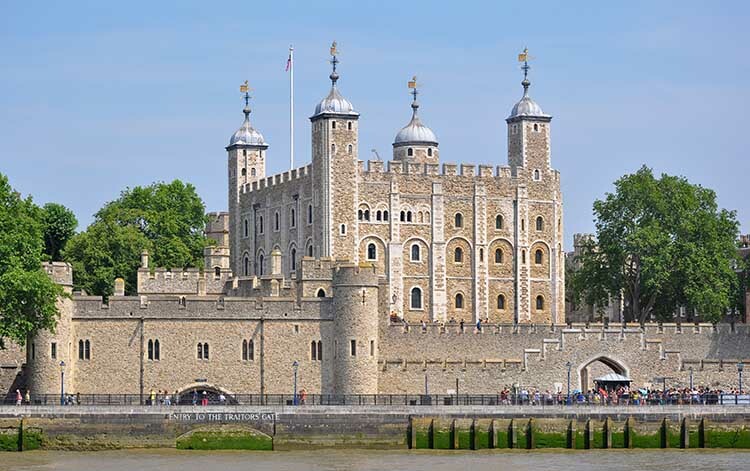 Is it a coincidence that on 12 February 1554 Lady Jane Grey was beheaded on Tower Green, which lies less than 200 yards away from the Salt Tower? Several other ghosts are said to make the Tower their home; phantom troops of soldiers reportedly appear there, as well as a lady in mourning with no face. The cities of York and Derby in England are also reputed to be a center of ghostly manifestations; consequently, they both thrive on hugely successful ghost tour industries. Indeed, the presence of many centuries-old buildings has given England the reputation of the most haunted country in the world. 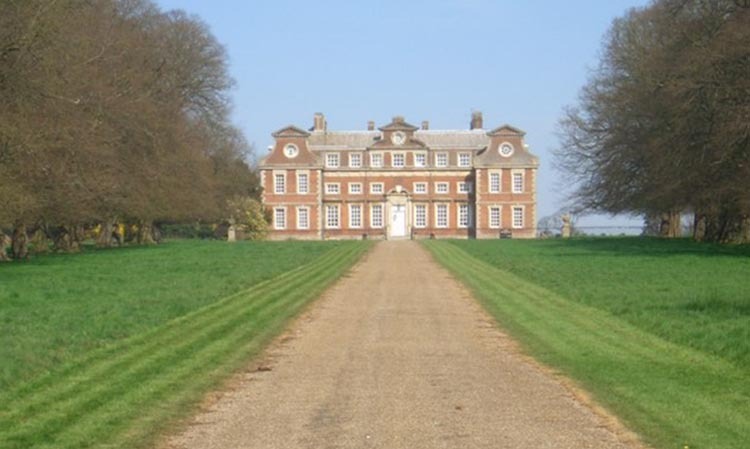 The Brown Lady of Raynham Hall has been seen quite a few times over the years. She is called the "Brown Lady" due to the brown brocade dress that the ghost has often been seen wearing while wandering the halls and staircase of Raynham Hall. The Brown Lady is famous mostly as being one of the most reliably photographed ghost in history. Although she has not been seen since 1936, she is said to wear a long brown dress or cape. No one knows who the Brown Lady is, or how she is connected to Raynham Hall. In 1936, the famous photograph was taken by photographers Captain Provand and Indre Shira during a shoot for the magazine Country Life. 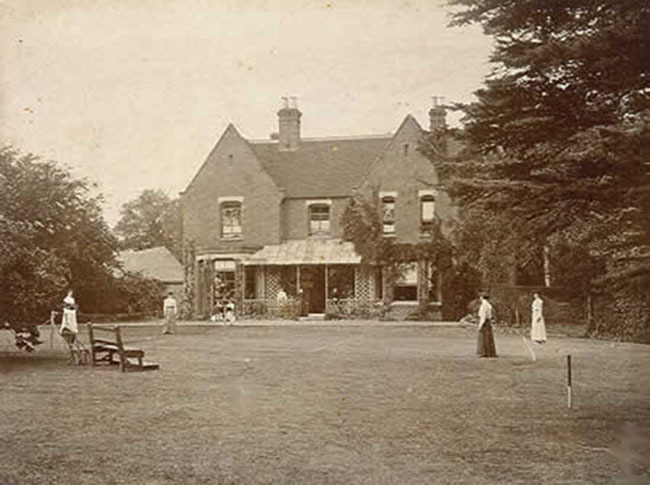 Borley Rectory is often called "The most haunted house in England." The site of the rectory originally held a monastery, which was inhabited by Benedictine monks. 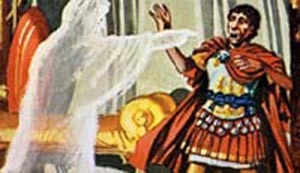 There are many references to ghosts in ancient Roman mythology. In 44 B.C., Brutus, an army general, spearheaded a plot to murder Julius Caesar. On March 15, he and his co-conspirators stabbed Caesar to death. Shortly thereafter - Brutus was visited by a huge apparition/ghost claiming to be Julius Caesar, and who then revisited him the night before battle. The purpose of the vision became clear to Brutus, who took it as an omen of doom. The battle was lost and Brutus killed himself afterwards. In Shakespeare's Julius Caesar the phantom is described as being that of Julius Caesar. The ghost of the Roman Emperor Caligula was said to haunt the Lamian Gardens of Rome, where his body had been hastily and unceremoniously buried after his assassination. The Kuchisake-onna was said to have caused mass hysteria throughout Japan during the spring and summer of 1979. Japan's Bon Festival uses drums and dancing to ward off the evil dead, much in the same manner of the Hungry Ghost Festival. The White House in Washington, D.C., is said to be haunted by the ghost of Abraham Lincoln and by several lesser specters. The former prison island of Alcatraz off the coast of San Francisco is said to be home to a number of ghosts of prisoners who died there. Athens, Ohio is named one of the most haunted places in America, and is known to contain many ghosts. One interesting fact is that, when drawing a line from each of the 5 graveyards, one creates a pentagram. Inside this pentagram is a college that is considered the most haunted campus in America. The city of New Orleans is sometimes called 'America's most haunted city' with numerous ghost reports, especially in the French Quarter. New Orleans' ghosts include pirates from the 18th century, through to 20th century spectres. The Winchester Mystery House is a mansion in San Jose, California which was once the personal residence of Sarah Winchester, the widow of gun magnate William Wirt Winchester. The property and mansion have been claimed to be haunted - including by Winchester herself - since construction commenced in 1884. Under Winchester's day-to-day guidance, its "from-the-ground-up" construction proceeded around the clock, without interruption, until her death on September 5, 1922, at which time work immediately ceased. The cost for such constant building has been estimated at about US $5.5 million (equivalent to over $75 million in 2012). It now serves as a tourist attraction. 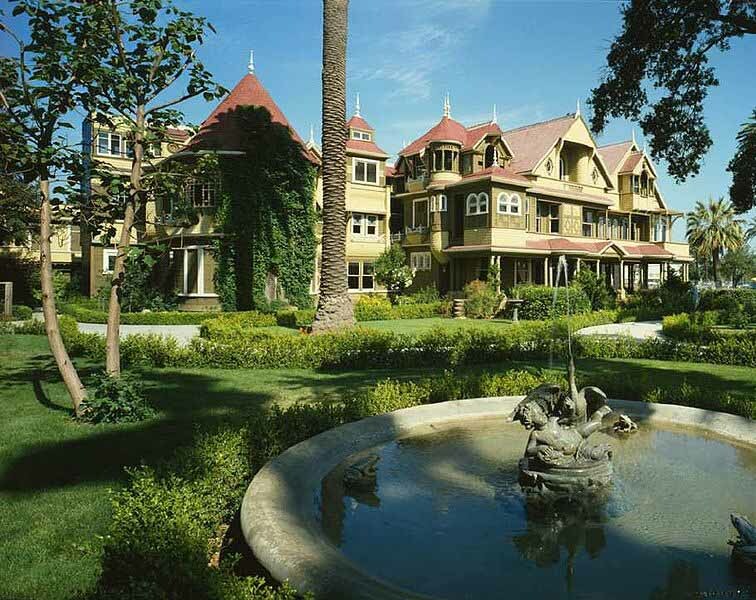 Though it is possible Sarah Winchester was simply seeking a change of location and a hobby during her lengthy depression, other sources claim that while consulting The Boston Medium, Winchester came to believe her family and fortune were haunted by the ghosts of people who had fallen victim to Winchester rifles, and that only by moving West and continuously building them a house could she appease these spirits. Located at 525 South Winchester Blvd. in San Jose, California, the Queen Anne Style Victorian mansion is renowned for its size and utter lack of any master building plan. 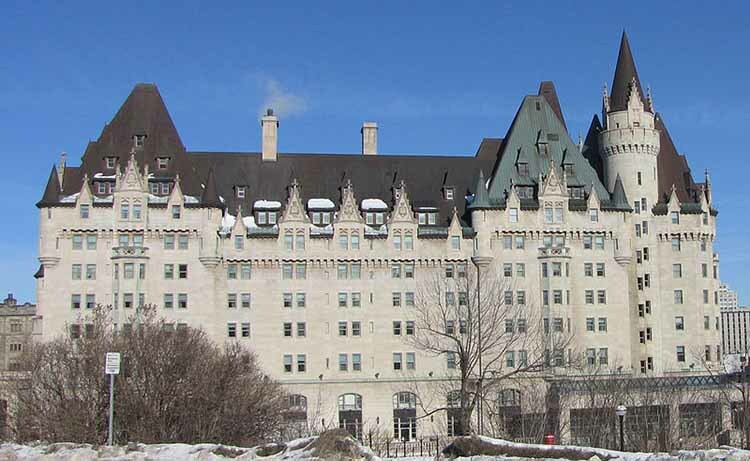 The Fairmont Chateau Laurier is a 660,000-square-foot hotel with 429 guest rooms in downtown Ottawa, Ontario, located near the intersection of Rideau Street and Sussex Drive and designed in the French Gothic Chateauesque style to complement the adjacent Parliament buildings. The hotel is above the Rideau Canal locks and overlooks the Ottawa River. The main dining room (now the Laurier Room) overlooks Major's Hill Park. The reception rooms include the Wedgewood-blue Adam Room; the Laurier Room defined by Roman columns; the Empire-style ballroom and the Drawing Room featuring cream and gold plaster ornament. The hotel was designated a national historic site in 1980. The hotel is said to be haunted, with numerous guests reporting to have seen the ghost of Charles Melville Hays and experiencing paranormal activities. Stories of the haunting began when Charles Melville Hays died on his return voyage on the RMS Titanic from Europe 12 days before the hotel's opening. Stories suggests that Hays' ghost rests within the hotel due to its significant importance to his life, and the fact that he never witnessed the grand opening due to his death. Guests have also reported seeing the ghost of a small child, and experiences the feeling of "being watched" the moment they enter the hotel. Other guests have also reported eerie sounds from the hotel and unexplained shaking. Sometimes when the deaths of souls has been tragic - the frequency of the deaths remains in a specific geographic location which sometimes becomes activated on the anniversary of those events. These are sometimes referred to as 'Psychic Imprints'. Wherever massive deaths and violent confrontations occur in a specific area, there is always the possibilities that ghosts may roam that area. In many war time battle zones - where hundreds of souls are killed in a short span of time - their souls remain trapped in the dimensions of the Earth plane - waiting to be freed. Many of them are stuck there because - they spirits do not know they have died - there are not enough guides to show them to the other side - the portals to the other close and trap them between dimensions. The souls might even continue to fight battles in the astral plane (fourth dimension) even though the war ended a long, long time ago. They may not realize that they have died and will continue to wage battle with other trapped souls. This could result in some degree of unexplained manifestation on the physical Earth plane - such as bushes moving - unexplained noises , etc. 'Psychic sounds' are by far the most reported phenomena in all cases of haunted areas. Another way of looking at this are - parallel realities - where as in another reality that is parallel to us - the battle is still playing out. People passing within the frequencies of the area where the battle occurred - will pick up the energies of the battle and the cries of the trapped souls. This will occur with stronger impact on the anniversary of the battle - when a sort of portal opens to those events. There are psychics / mediums who know how to release the trapped souls - so they no longer haunt the area. Many incidents occurred that result in ghostly manifestations to this day. The bloodiest battle ever fought on American soil occurred during the The American Civil War. On a balmy afternoon in June of 1863, Federal General John Buford peered through his binoculars across a field just west of the town of Gettysburg. He was perplexed as he gazed at a column of Confederate soldiers marching along Chambersburg Pike. He knew this body of men was too large for a raiding party - they were an advance element of Confederate General Heath's division. This resulted in the pivotal battle of the American Civil War. Three days later, fifty three thousand men would soak the fields red with the blood of the dead and dying. That would help explain why the abundance of ghost sightings are reported time and again from visitors who frequent the town and battlefield year after year. It is as well with little wonder that Gettysburg has obtained the reputation of being the most haunted place in America. Even the skeptics who refuse to believe even in the possibility of ghosts, won't refute the possibility of this haunted locale. On July 1, 1863, what began as a skirmish soon escalated into a heated battle with the arrival of Federal General John Reynolds' infantry. The Confederates pressed, and soon found the Union troops retreating chaotically towards the little town. The streets were thick with soldiers as the Federals retreated toward a designated rallying point just beyond town at Cemetery Hill and Culps Hill. Confederate sharpshooters took up positions through out as their prey was easy and plentiful. Some took position in the Farnsworth House, a small home situated along Baltimore Pike. Their perch was magnificent due to the locale on the main road through town. They mercilessly fired upon retreating soldiers, often hitting their mark. The streets were strewn with dead. Today, the Farnsworth House functions as a Bed and Breakfast. Bullet holes can still be seen on the south side wall. It is here that many guests report seeing an apparition at the end of the bed during the night, while other guests have reported doors opening and closing through their own volition. One woman incredulously has reported her infant being lifted by unseen hands and gently placed back down. Pointing northeast toward the Plum Run, she turned to look and the man vanished. The ranger asked for a description, and she felt he looked ragged and like that of a hippie. Barefooted with torn butternut shirt and trousers, wearing a big floppy hat. This was often the attire of Confederate Texans. A few weeks later, the same ranger was approached by yet another visitor with the same question. The man said he was taking pictures and a man mentioned to look elsewhere and disappeared. His description was identical to the woman's. The Little Round Top is an unimpressive hill overlooking the Devils Den and the wheat field. As the extreme left flank of the Federal lines, it has had its share of carnage. During the filming of the movie Gettysburg, many re-enactors would find themselves with some down time. Although the movie was not filmed on the battlefield, it was not uncommon for these extras to walk upon the battlefield in their period uniforms. One small group of men found themselves atop the Round Top, admiring the view as the sun began to set. A rustling of the leaves behind them alerted them to the presence of a stranger. From the brush emerged a rather haggard looking old man, dressed as a Union private. The man was filthy and smelled of sulfur, a key ingredient of the black powder used in 1863. He walked up to the men and as he handed them a few musket rounds, he said 'Rough one today, eh boys?' He turned and walked away. As the reenactors looked upon the musket rounds, they looked up to see the man had vanished. When they brought the rounds into town, they were authenticated as original rounds 130 years old! Many visitors have reported the smell of gunpowder, and have heard gunshots and screams from the Little Round Top over the years. Friday, July 3, 1863 was a new day already polluted with the stench of death and war. For two days, 175,000 men have engaged in the bloodiest battle before or since on the American continent. The morning was somewhat uneventful, with the exception of some fighting at Culps Hill; which had ended by late morning. At 1:00 p.m., 140 Confederate cannon opened fire on the Union center. For two hours, the largest cannonade ever witnessed pounded the Federal lines. So fierce was the shelling, that one could not see across the mile of open field to ascertain whether or not their targets have been hit. So loud was the shelling that the attack was heard in Washington DC; some 80 miles away. This was the preamble for one of the most infamous military events. This was the preamble for what was to become known as Pickett's Charge. After the second hour of the cannonade was up, some 12,000 Confederate infantrymen emerged from the woods. Formed in battle line, they began the deadly march across the mile of open field. How the Union soldiers must have gazed wide eyed as 12,000 fixed bayonets glistened in the summer sun, all preparing to converge on a single stretch of stone wall known as The Angle. Long range cannon fire sent explosive shells into the rebel ranks. As they neared, the artillerymen changed to canister shot; a typed of buckshot fired from a cannon. Closer still the rebels marched; closing holes in the line left by soldiers killed en masse. A deafening musketry opened from the Yankee lines behind cover of the stone wall. Still, the Confederates came. As the survivors reached the stone wall, brutal hand to hand combat ensued, but alas, the rebels, tired and outnumbered quickly lost momentum. The entire charge lasted less than an hour. In that time, 10,000 Confederates lay dead and dying. With the failure of the charge, the battle ended. Robert E. Lee retreated back into Virginia. Thus ended Lee's second invasion of the north. Thus ended the Confederacy's hope for independence. Although the war would continue for two more years, the Army of Northern Virginia would never fully recover from this loss. The Angle is a beautifully maintained area of landscape. One can still look out across the field from where Pickett's Charge originated. A park ranger while on routine patrol one night noticed a man on horseback. As the rider neared, the ranger wondered who would be on the battlefield so late; on horseback. Upon closer inspection, the ranger noticed the attire of the rider. It was that of a Civil War officer although the allegiance could not be ascertained. The unknown horseman approached to within 10 feet of the car and promptly disappeared. Other visitors have reported the sound of galloping horses in the immediate area of The Angle, although none were present. Sounds of the cannonade have permeated through time as people report hearing the thunderous roar of battle. One visitor even reported seeing Robert E. Lee himself, sitting atop his horse, Traveler, on the opposite side of the field. A resident of Gettysburg, and amateur ghost hunter mentions that during a stroll across the field on a warm summer night, cold spots were common. Going from balmy humidity to sudden cold, so cold he could see his breath, the fellow continued the path of Pickett's infantrymen. I have met other psychics who have been to these grounds and reported the pain and anguish from the energies of the soldiers who died in that battle. Two of the most bloody battles fought were Chickamauga and Stones River, both in Tennessee. Nearly 125,000 men fought at Chickamauga from the morning of September 19th to the 20th of 1863. When it was all over, the combined casualties numbered 37,129. They compare with 23,582 at Sharpsburg (Antietam) known as the "bloodiest day of American history" and 43,454 for the three days of fighting with larger armies at Gettysburg. Chickamauga is derived from an ancient Cherokee word meaning "River of Death". And death was all around this heavily wooded area occasionally spotted with uncultivated, vine-strewn, thicket- matted stretches of ground sometimes disturbed by outcroppings of limestone rock. In other words, land that no farmer would have bothered with since it would have required a massive amount of work and toil to bring up to minimal farming standards. 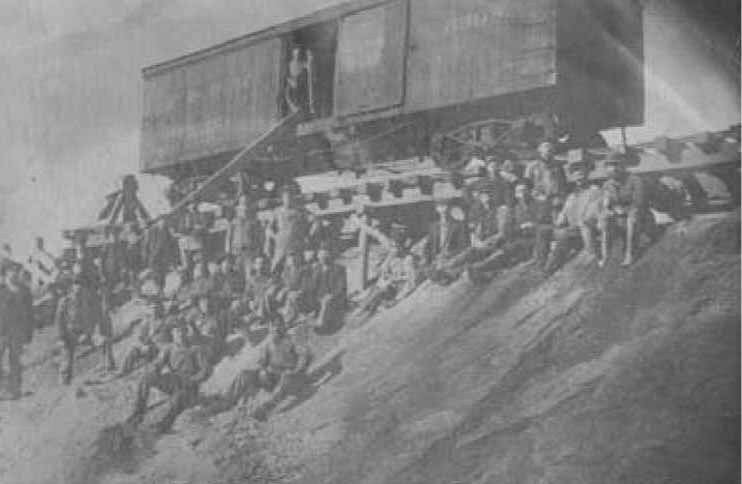 The real prize that the Union army hoped to gain from this battle was capture of Chattanooga which was the rail center and major city of the Middle South. It was the greatest Southern victory of the entire war. Perhaps the most bizarre story concerns "Old Green Eyes". Who or what is Old Green Eyes? Old Green Eyes was a soldier who died in the war. There are two legends concerning his death. One is that a Confederate soldier's head was severed from his body which was blown to bits by a cannon ball. All that was left to bury was his head and, according to legend, on misty nights he roams the battlefield, moaning mournfully, searching for his body. Another legend is quoted as saying that Old Green Eyes roamed the area long before the Civil War and was even seen moving among the dead at Snodgrass Hill during a lull in the fighting. Probably the most stubborn phase of the campaign was at Snodgrass Hill which is some of the roughest and hilliest terrain in the entire park area. Many people visiting the park near dusk have seen two big glowing eyes approaching them and have heard an agonizing groaning sound which sent shivers up and down their spine. Charlie Fisher, a forest ranger, says that in the early 1970's two different people both wrecked their automobiles against the same tree. They both sworn to have seen Old Green Eyes. A man named Ed Tinney did see Old Green Eyes on several occasions. He saw the ghost one foggy night while walking along one of the trails which wind through the park. He said the shape was human-like but wasn't human. When he first saw it, it was less than twenty feet away and passed right by him! He described the hair on the "thing" as long, like a woman's hair, with eyes almost greenish-orange in color. It's teeth were long and pointed like fangs and was wearing a cape which seemed to be flapping in the wind, even though there was no wind! The next thing he knew, it just disappeared right in front of him. A ghost ship is a term used for two types of vessels. The first use refers to an ethereal ship that appears as a ghostly apparition. They are usually ships that have been lost at sea or have been sunk, but somehow mysteriously reappear. The second use of the term describes a real ship that is thought to be lost or sunk but physically reappears later, usually after their crew mysteriously disappear without any explanation or die by some unknown cause. Perhaps the most famous of this type of ghost ship is the Mary Celeste, a ship that was found abandoned between Portugal and the Azores in 1882, devoid of all crew although the ship was completely intact. Another of this type of ghost ship was the MV Joyita discovered abandoned in the Pacific in 1955. In 2006, the Jian Seng was found off the coast of Australia, and as of 26 March little is known of its origin, or reason for being here. Ghost ships are generally linked to shipwrecks and disasters on water. The ghost ship usually appears at the scene of the disaster on a stormy night as a projected illusion. Many stories involving the sightings of ghost ships come from the British Isles and surrounding areas - this includes the Goodwin Sands. Legend has it that more than 50,000 people lost their lives on the sandbank. The 'Lady Lovibond' is the most famous of the ghost ships. It was shipwrecked on February 13, 1748. Every 50 years the Lady Lovibond is seen as a ghost ship in the area. Pirates who sailed the seas in the 17th and 18th centuries are often associated with ghost ships. Whether observed on land or at sea, can often be explained as optical illusions. Mariners are familiar with the sight of ships sailing through the sky above the horizon - a simple mirage caused by the refraction of light rays. Among the most famous of the phantom ships is the legendary The Flying Dutchman. This sailing ship, feared by mariners as an omen of disaster, supposedly appears during stormy weather off the Cape of Good Hope, at Africa's southern tip. According to one version of the legend, Van der Decken, the captain of the Flying Dutchman, swore that he would round the cape even if he had to sail straight into the wind. Because of this oath, Van der Decken was condemned to sail forever against just such an adverse wind. According to folklore, the Flying Dutchman is a ghost ship that can never go home, but must sail 'the seven seas' forever. It is usually spotted from afar, sometimes glowing with ghostly light. If she is hailed by another ship, her crew will often try to send messages to land, to people long since dead. The name Flying Dutchman has become synonymous with ghost ships; its name often used as a generic term for any apparition-type ghost ship. Following Queen Mary I's permanent docking in California, the ship became a subject of haunting rumors. Since the 1980s, this supposed haunting has figured significantly into the marketing and promotion of the ship, with various attractions and tours presenting the theme for visitors. The ship was voted "one of the top 10 most haunted places in America" by Time Magazine in 2008. In particular, Cabin B340 is alleged to be haunted by the spirit of a person who was murdered there, and people have reported hearing sounds of children playing in the nursery. 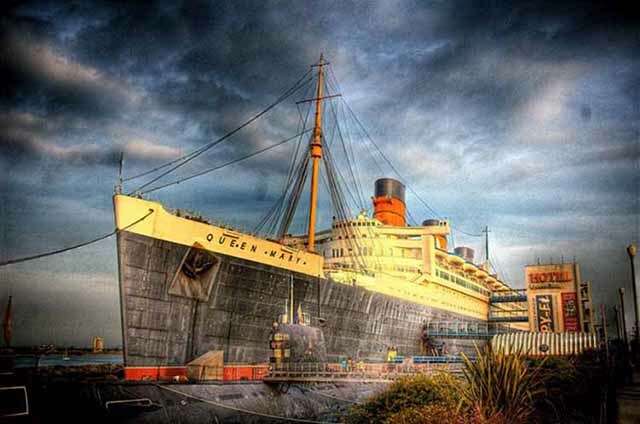 Other reported ghosts include a young sailor who was accidentally killed in the ship's engine room, crew members of the Curacoa who were killed when Queen Mary collided with her, and an unidentified "lady in white". At least one book has been written on the subject. Door 13 in the engine room is the place where a 17 year old young man was crushed trying to escape a fire. People have heard knocking from the pipes around which sometimes feels hot to the touch. that provides access to the Queen Mary's propeller shafts. Sounds of people having fun in the pool are heard, but on investigation there is no-one there. Some people are supposed to have seen wet footprints appearing - with no feet making them! Many years ago now, a medium was invited on board the ship and she identified the swimming pool dressing boxes as being the center of the spiritual activity on board the Queen Mary. She called one of the boxes "a portal to another realm". This is one of the most original, untouched areas of the ship. You can see the swimming pool and the dressing boxes area only via the Queen Mary's guided tour today. In the front desk area of the ship sightings include a mysterious woman in white who will be sighted walking until blocked from view by a pillar and never coming out from behind. 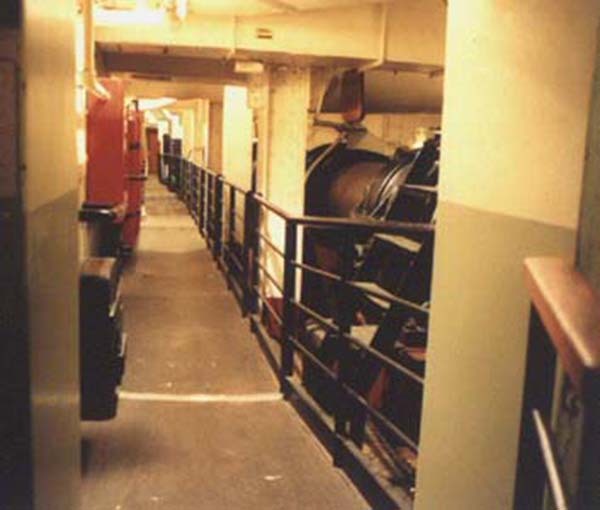 Also, a couple has been seen walking down the hall to either side of the main entry to the first class rooms, but are never seen in the hallways themselves.� Ghosts have been seen in other areas where people died - such as engine room #2. During WW II - strange incidents and odors were reported. An "X-Files" episode depicted the ship as a existing in parallel realities, one during WWII, and one in present day. You could see Muldar and Scully co-exiting in both realities. Other television shows have also incorporated the strange goings-on, in their storylines. The ship obviously has many interdimensional doorways - that would keep the best of psychics busy in any dimension. This also applies to areas where many car accidents occur and the deceased souls remain in order to influence others to make the area safer - by perhaps putting up speed signs, traffic lights, guard rails, etc. The deceased souls will be seen by those coming into the frequency. Between 1906 -1908 a bridge was built over White Lick Creek to hold railroad tracks. During this period of construction one of the laborers was killed after falling into an unsealed support. The railroad didn't want to waste time or money to get him out, so the support was sealed with the worker still inside. In some versions of this tale, the worker's arm hung out of the support, and had to be cut off. On hot summer days you can see the ghost's tears on the concrete of the bridge. Some people will tell you that there is no ghost - that the screams are just the product of wind, and that the tears are caused by condensation. But others will tell you that the ghost is real. There are 2 other stories about ghosts connected to this bridge. One has to do with a train engineer dying when a train crashed and went over into the creek. The third version is about a woman who was crossing the bridge. She heard a train coming -jumped off the tracks - but her young child slipped through her arms and died! 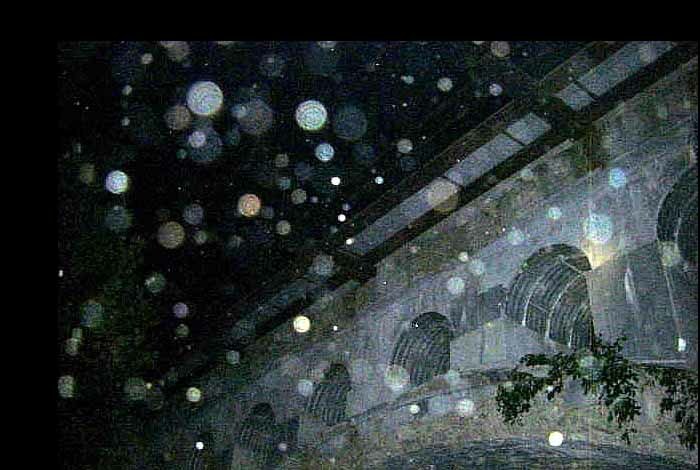 Orbs, Ghosts, or Dust on the Lens? There are instances where a person is physically seen at a specific place and time, yet that person had died a few hours before. In this instance the arriving ghost appears as the real person, speaking and wearing the same clothes. One might think of this as biolocation, time travel, out of body experiences, parallel reality, or looping in the space/time continuum. There is much about reality shifts that we do not as yet understand. Mark Twain the writer had an experience like this. He met a women he knew at a reception and then later met her at dinner. However the physical woman was delayed on a train running late for the reception. This reaps of parallel realities. In this case the woman was not actually see a ghost but it was another aspect of herself existing in a parallel reality. Long ago there was a large band of Dakota-Sioux Indians who had spread to a village in the present Jackson Hole Basin of Grand Teton National Park in Wyoming. The Teton band flourished, and its people were healthy and strong because they ate plenty of buffalo meat. Usually when they camped for the night, a crier would go among the lodges and call: "There will be many buffalo tomorrow. Be on the alert!" One day after the Tetons returned to their camp from a hard buffalo hunt, a young man announced that he wished to marry the most beautiful girl in the tribe, the Chief's daughter. Her father said, "I will not give you my permission until you bring me many horses." So the young Indian set out in search of many wild horses, hoping to please the Chief and win his beautiful daughter for his bride. While the young brave was away, his tribe abandoned their regular campsite and moved elsewhere. Later, the young Indian returned to the deserted camp with several captured horses. As it was late in the day he thought he would take shelter nearby in a solitary lodge. At first, he could not find a doorway into the lodge, because the sides were covered halfway up with sod. Finally, he managed to make an entrance. Inside were four high posts that had been driven into the ground. The posts supported a kind of burial bed. On the bed lay a woman whose clothes were ornamented with elk's teeth. She turned her head looking down at the young Teton brave. He immediately recognized her as a member of his tribe--but now she was a Female Ghost. They stayed there for a long time and she became his wife. One day he said to himself, "I think I will go on a buffalo hunt." Although he did not speak aloud, the Ghost Woman knew his thoughts and said, "You are hungry for buffalo meat? Mount your horse and ride back to the bluffs. "When you come to the buffalo herd, rush into the centre of them and shoot the fattest one. Bring home the hide and buffalo meat. Roast the meat and bring me a share before you eat yours." The young Teton Indian brave left and followed Ghost Woman's instructions. When he reached the valley, he came to a large herd of buffalo. He charged his horse at full speed into the middle of them and shot the fattest one. He skinned it and cut up the meat, carrying the robe and meat upon his packhorse. He skewered a large piece of meat and roasted it until it was cooked enough, then he took it to Ghost Woman, who was standing in the centre of the lodge. Her husband was startled to see her standing there. Rows and rows of beautiful beadwork decorated her leather clothing. Already knowing what the young brave was thinking she said, "Please do not be afraid of me! " From that time on, they talked freely and planned what they would like to do. The young Indian brave said, "Why don't we begin our life together like our parents did when they were first married?" But the Ghost Woman replied, "No, no, that would never do, because we will need to pitch our tent during the day and travel by night." The young brave wondered about this arrangement. That is how it happened that they traveled at night. Ghost Woman walked ahead with her head covered, never saying a word to her husband as they travelled. Her legs were invisible. She made no noise as she floated along, ghostlike. Whenever the young Teton Indian brave thought about anything, Ghost Woman already knew what it was that he had in his mind. Is this why the Teton Indians say, "Beware of Ghosts because Ghosts know all things." This is the way Teton Ghost Woman and the young Teton brave lived. Their tribal people never found them again. The Chief's daughter wondered why her young brave never returned to her. Finally, the young brave also became a Teton Ghost, floating along with the Teton Ghost Woman, every night, forever. A brave, young warrior for the Chickasaw Nation fell in love with the daughter of a chief. The chief did not like the young man, who was called Blue Jay. So the chief invented a price for the bride that he was sure that Blue Jay could not pay." Bring me the hide of the White Deer, said the chief. The Chickasaws believed that animals that were all white were magical. "The price for my daughter is one white deer." Then the chief laughed. The chief knew that an all white deer, an albino, was very rare and would be very hard to find. White deerskin was the best material to use in a wedding dress, and the best white deer skin came from the albino deer. Blue Jay went to his beloved, whose name was Bright Moon. "I will return with your bride price in one moon, and we will be married. This I promise you." Taking his best bow and his sharpest arrows Blue Jay began to hunt. Three weeks went by, and Blue Jay was often hungry, lonely, and scratched by briars. Then, one night during a full moon, Blue Jay saw a white deer that seemed to drift through the moonlight. When the deer was very close to where Blue Jay hid, he shot his sharpest arrow. The arrow sank deep into the deer's heart. But instead of sinking to his knees to die, the deer began to run. And instead of running away, the deer began to run toward Blue Jay, his red eyes glowing, his horns sharp and menacing. A month passed and Blue Jay did not return as he had promised Bright Moon. As the months dragged by, the tribe decided that he would never return.But Bright Moon never took any other young man as a husband, for she had a secret. When the moon was shinning as brightly as her name, Bright Moon would often see the white deer in the smoke of the campfire, running, with an arrow in his heart. She lived hoping the deer would finally fall, and Blue Jay would return. A popular genre of literature from the early Renaissance to the early twentieth century was the Dialogues of the Dead. These were based upon the Witch of Endor story and the visions of Hades found in both Homer's Odyssey and Virgil's Aeneid. In Odyssey, Odysseus travels to Hades and sees the shades of his former colleagues, including some he did not know were dead, and pours out fresh blood, which the dead hunger for, until he can find Tiresias and get guidance on his voyages. In the Dialogues of the Dead genre, authors would somehow contrive a device for summoning the dead to a character who would then speak with them and ask them questions about philosophy or current events. These "ghosts" were under control of a great sorcerer or otherwise compelled to speak. The genre was most popular in the 18th century, and examples were written by many. Jonathan Swift satirized the genre in the third book of Gulliver's Travels by having Gulliver summon the ghosts of former kings and great conquerors and finding, instead of nobility, petty, childish, and stupid people who possessed no wisdom and who accomplished their great deeds for mean and selfish reasons. Further, he finds that the ancestors of many great lords and ladies of his day were stable boys, servants, etc. In each of these cases, the fictional ghost offers counsel to the living and thus acts as a messenger from the implicitly greater world beyond. However, the ghost messenger can also act in a way reminiscent of the guardian angel in fiction. In some fictions, a departed relative (usually) or friend guides the living to either a moral or material benefit. Such ghosts can either act as a 'deus ex machina' by resolving plot points with supernatural power or as a mentor who offers sagacity to the characters with a limited point of view. Finally, the ghost messenger features in fiction as a ghost in disguise. A character otherwise regarded as living turns out, in the fiction's denouement, to be a supernatural agent. In folk music, there are songs featuring lovers and objects of affection who must leave before dawn (a variant on the Cupid and Psyche story) because they are ghosts. Additionally, some urban legends, such as the "Hitchhiking ghost", turn upon an anonymous stranger (or Elvis Presley in a common variant) who is revealed to be a ghost in the clinch of the story. Such a ghost in disguise usually, in fiction, offers statements or visions that are relevant to the plot, but not in a way comprehensible to the characters. Such gnomic or oracular statements reward the reader with knowledge greater than the fiction's participants.